Having watched and admired Avatar: The Last Airbender, I have now watched all of its semi-sequel, The Legend of Korra. While there are aspects of Korra that are superior to Avatar, I don't think the series reaches the same high level, and I think that the reason has to do with the nature of television. As I understand it, when Avatar was given the green light for production, the commitment was for three seasons right from the start. Because of this, the creators Michael Dante DiMartino and Bryan Konietzko were able to know how long they had to tell their story and how they could develop their characters over time. It resulted in a show I referred to a novelistic. To the best of my knowledge, Korra's initial commitment was only for a single season. As a result, the show suffers from a common TV ailment. Stories and character arcs can only be developed one season at a time, as nobody knows how many shows will eventually be produced. In Korra's case, this led to disjointed stories and character arcs compared to Avatar. The first season was underdeveloped. The villain, Amon, was the head of a social movement built around resentment of those with bending powers. Except for an early robbery attempt broken up by Korra, there were no other events that would explain why the general population resented benders. When Amon was revealed to be a bender himself, public opinion immediately shifted against him, but if there was anger against benders, why would the population now side with Korra and her friends? There was an attempt to tie the second, third and fourth seasons together. In season two, Korra's uncle Unalaq attempted to free and merge with an evil spirit Vaatu and bring about 10,000 years of darkness. In season three, the villain Zaheer revealed that Unalaq was a renegade member of a group called The Red Lotus. 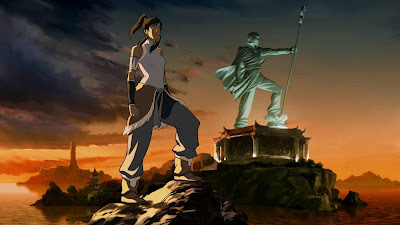 In season four, the defeat of Zaheer led to the rise of a military dictator, Kuvira. Unfortunately, these attempts at continuity were band-aids. Each season there was just another villain bent on destroying Korra. In this way, each season's arc devolved into formula. This is a common problem with TV series due to the nature of renewing for single seasons. Boardwalk Empire suffered from the same problem, where there had to be a new threat to the main characters for each set of episodes. This limitation is a major drawback to coherent storytelling and is something that Avatar miraculously avoided. Has there been another series with continuing characters that got a multi-season commitment before going on the air? Formula also worked it's way into other parts of Korra. Team Avatar was again four characters, two male and two female, with one of the males as comic relief. The brother and sister Desna and Eska seem based on the deadpan Mai in Avatar. This season by season development also led to questionable character appearances. Zuko, a character from Avatar, appeared in season three as he was concerned about the threat posed by Zaheer, but he was absent from season two, which was an equal threat to Korra and a larger threat to the world. While it was nice to see the character return, he didn't have much to do and his appearance was ill-timed relative to the levels of danger Korra faced. The large cast caused several characters to remain undeveloped. Suyin Beifong had a large family, and while she was given enough screen time to become a rounded character, her husband and children were not for the most part. While Tenzin and his children were well developed, his wife Pema was not. Kai was heavily featured for awhile and then seemed to vanish into the crowd. On the plus side, the production values were higher than the Avatar series. There was more 3D animation brought in for vehicles and machines. The fight scenes were better choreographed and animated. The climax to season four was as elaborate as anything I've seen done for television animation. In Avatar, there was the tendency to pop character's faces into extreme takes. I don't object to the takes, but felt that they were clumsily animated and were jarring as a result. The facial animation in Korra avoided the extreme expressions, though once again television budgets resulted in lots of limited animation in acting scenes. The reunion and reconcilation of the Beifong family was nicely done. Toph Beifong was brought back from Avatar and given enough screen time to be as vivid as she was in the earlier series. Her relationship with her daughters and their sibling rivalry was one of the more satisfying parts of the series. Season four seemed to be about reconciliation and redemption. Asami's father was brought back to redeem himself. Even the villains Zaheer and Kuvira were shown to be misguided rather than just evil. Bolin, Varrick, Zhu Li, Prince Wu and Bataar, Jr. are all brought firmly into the good guy camp regardless of their earlier actions. Like Avatar, Korra will continue in graphic novels. It's interesting, though, that the series creators will be stepping out of animation, at least for a while. Working on an animated TV series is exhausting and I can imagine how much more exhausting work on Avatar and Korra must have been due to the ambitiousness of the shows. DiMartino will be writing novels and Konietzko will be creating a graphic novel. Based on their animation work, I look forward to what they do next. While I've listed areas where I thought Korra had weaknesses, it's still an immense achievement. Falling a little short of Avatar: The Last Airbender is nothing to be ashamed of, and in some ways it exceeded the earlier series. While I'd pretty much given up on TV animation as a place for quality storytelling, DiMartino and Konietzko managed to beat the system. I congratulate them on that and hope that broadcasters are smart enough to learn from their success. In regards to a show being green lit for multiple seasons, I believe Breaking Bad and Game of Thrones were. But, like Avatar, those shows have very definite endings to their stories. Shows like Korra are just made up as they go along, so even if they had multiple seasons it could have still felt somewhat disjointed since the series didn't have as much of an end goal like saving the world. Agreed with the criticisms of Korra. Season 2 in particular was really weak for how much of the characterization from season 1 it seemed to ignore. Seasons 3 and 4 were better at that. Season 3 in particular had a really nice arc and an incredible villain. I've noticed a lot of cartoons adding 'stealth plot' over time. Mostly disconnected one-shot stories, but then bits of pieces of connecting storylines and worldbuilding until a direction is established. Adventure Time started this, but Steven Universe and Gravity Falls also followed this direction and now have very strong plot direction. Still, Avatar had the most straightforward plot thanks to the multi-season commitment. Don't despair about TV animation storytelling. The pickings in Canada are pretty bleak, that's true, but there are still good shows being produced elsewhere. And even Canada has some entertaining productions. It's just that Corus and DHX aren't very ambitious when it comes to storytelling, they're more about merchandising potential. But some of the other studios like Guru and Arc are developing interesting work.